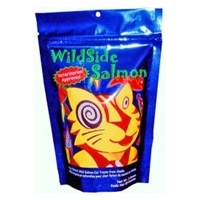 Wild Side Salmon Regular Cat Treat 1.5 oz. WildSide Salmon is the World's only "freeze-dried" Wild Alaskan Salmon for Dogs & Cats. Naturally high in protein and low in "ash". Wild Side Salmon is not only a healthy addition to your pets diet, it makes for a great treat and your pet will love the flavor.